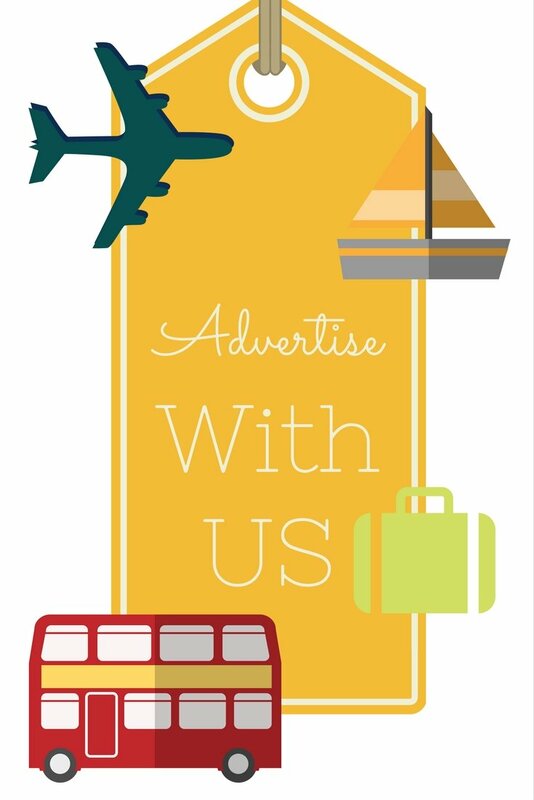 "Meet Magical Steps Travel, a five star tour operator that will make your Kusadasi and daily Ephesus tours the highlight of your cruise..."
Go to the bottom of the page to inquire about your private tour with this 5-star tour agency. Book early to avoid disappointments, due to their status, they do sell out quickly! The summer of 2013 was the last time I was sitting at the desk by the Crystal Symphony gangway, seeing the guests off on the way to their daily Ephesus shore excursions. As always, I was handing them local maps and giving the last minute info on Kusadasi, Turkey, the port we were docked in. Just like many times before, the welcome in Kusadasi did not disappoint: the red carpet was rolled out and the magical sounds of the local entertainers and dancers on the pier got us all goose bumps, promising a very special and exciting day. Sitting there, I was very happy to see that a big majority of people understood the importance of taking an organized tour when seeing this spectacular site. 'They must have read my website' I thought jokingly. "Our guide was wonderful. 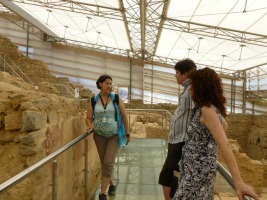 She was very knowledgeable and the sites were excellent. Great tour and very professional service. A++++" Keith C.
Because, although this website primarily focuses on getting around on your own, Kusadasi and Ephesus are one of the port days when we highly recommend taking an organized tour, the reasons of which we thoroughly explained in our article Why Taking an Ephesus Shore Excursion is a Must. I noticed that apart from taking ship organized tours, a many people decided to go with private daily Ephesus tours they booked online. "What a perfect, splendid day. We were a party of 6 with 3 generations ranging from 11 years old to 80+. Taner met us at the cruise port. He was a fantastic guide for the day. Knowing we had been to Kusadasi several times before, he tailored our trip to include exactly what we preferred. The driver was also great. I highly recommend Magical Steps Travel. The pre-trip communication was also timely, detailed and clear. Do not hesitate to visit the beautiful country of Turkey." 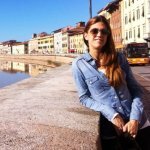 Michelle F.
MCPE: Gonca, welcome to Mediterranean Cruise Ports Easy and thank you for answering these questions for our readers! Although I have already talked about the importance of taking organized daily Ephesus tours, what are your thoughts on it? What feedback do you get from the guests who were not sure about booking a tour but were in the end happy they did? GONCA: Ancient Ephesus city is one of the rare ruins in the world where you can see and feel what life in the Ancient times really used to be like. And you get to feel the full impact of it only in an organized tour with a tour guide. Otherwise, if you go there by yourself, all you see is old stones. Also, Ephesus is close to some other historical places which are very important in Roman and Christian History. It is possible to see them in one day but under the condition that you have organized transport. Cruise ships don’t stay in port for long time. So if you book an organized tour you would spend your time very effectively. Throughout their cruise, ships dock in different ports and countries around Europe. 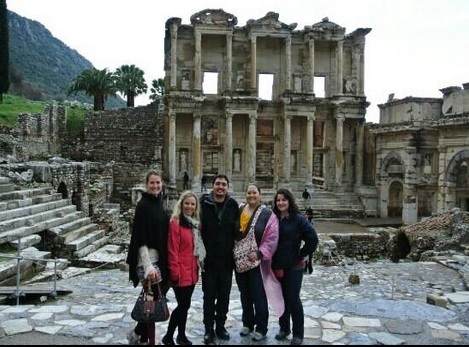 But as you can read from the visitor’s reviews, most of them say that the daily Ephesus tours by professional tour guides from Magical Steps was the highlight of their journey, and they are glad they did it. MCPE: What gives the Magical Steps a cutting edge when compared to other tour agencies online or the ship-organized daily Ephesus tours? GONCA: First of all, we are a local tour agent established in Kusadasi, Ephesus region. 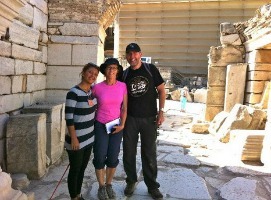 In our Ephesus tours we use our own local guides that we have known for a very long time. They are professional licensed local tour guides and speak fluent English. At the time of booking we let our tour guides know about the expectations, requests or needs of the visitors, which gives them a week's time to prepare. With regular ship booked shore excursions, the reservation department only knows which tour guide will do the tour 1 or 2 days prior to tour date. Also, considering the fact that groups booked on the ship are much bigger, tour guides cannot attend to everyone’s needs and wishes. At the Magical Steps we can also change the tour itinerary at the time of tour, which is impossible with large size group tours from the ship. In a private tour our guide is always with the visitors, acting as their private host. What really differentiates the Magical Steps is, arranging a tour guide according to the visitors’ expectations which is a private tour in the full sense of the word. Our visitors will have a private Ephesus tour guide and a driver with a clean, luxurious, A/C van arranged for them. They will be the only ones that our tour guide is dedicated during the tour. Private Ephesus tour prices are very reasonable compared to a regular ship booked Ephesus tours. Maybe they will never have chance to see Ephesus in their lives again which is a highlight of the entire cruise journey. So we would recommend a private tour for them to get most of Ephesus. Also there are no hidden costs in our tours. All the entrance fees stated in the itinerary, private tour guide, private transfers, lunch, parking, petrol and local tax are included in the price. MCPE: Having taken many tours in Kusadasi and daily Ephesus tours myself I know that Turkish tour-guides in general are some of the best, most passionate and most-knowledgeable in the world. Could you please tell us why is it that the tour guides working for your company get so many praising comments? GONCA: It is not easy to be a tour guide in Turkey because we don’t just take visitors to particular museums showing particular historical periods. "Our group of 4 people , 2 with walking issues, were met by our guide Ugor at the cruise ship terminal. From the moment we meet it was a wonderful experience. (...) I would recommend this company to anyone visiting Turkey." There is 12500 years of recorded history in Turkey (Asia Minor) and there are different periods and cultures in each region and sometimes they all reflect on the sites at the same time. That's why it is very important for a tour guide to be proficient at all these historical periods and cultures and can put them into perspective for foreign visitors. That's why Turkish government is very particular about educating tour guides. There are even departments at universities to become a tour guide. Magical Steps was established in 1993 and we have many professionally licensed tour guides who have been working for us for many years. We choose them very carefully depending on the visitors' feedback as customer satisfaction is the number one issue for our company. We know that our guides both represent Turkey and Magical Steps Travel. MCPE: Which tours that you offer would you recommend for the first time visitors to the region? GONCA: We would suggest "Enjoy the Roman Ephesus and Its Christian Heritage Tour". It is the best tour to learn about both Ephesus history and surrounding places. The visitors will have an extensive tour in this ancient site where they will see the following: the Hadrian’s, Trajan’s and Domitian’s Temples, the huge Roman bath, the Harbour Street, the Marble Street, the Gates of Mihridates and Mazues, Commercial Agora, the Latrina, the Scolastica Baths, the Curetes Street, Polio Fountain, Memnius’ Monument, the Prytaneion, Odeon, the Satet Agora, the Celcus Library and the biggest amphitheater in Turkey. This tour also includes the House of the Virgin Mary which is located in a nature park between Ephesus and Selcuk. This is believed to be the last residence of the Virgin Mary, Mother of Jesus. The peaceful site is sacred to both Christians and Muslims and is visited by many tourists and pilgrims. This House was later visited by Popes Paul VI and John Paul II, who confirmed its appropriateness as a place of pilgrimage. On November 29, 2006, Pope Benedict XVI celebrated a mass here. The tour also includes a visit to the Basilica of St. John, which was a great church in Ephesus, constructed by Emperor Justinian in the 6th century. It stands over what is believed to be the burial site of St. John, who is identified as the Apostle, the Evangelist (Author of the Fourth Gospel) and the Prophet (Author of Revelation). From the hill where the Basilica was erected, the visitors will have a wonderful panoramic view of the valley of Ephesus. Finally, there is also the visit to the ruins of the Temple of Artemis (Artemision), which was one of the Seven Wonders of the World. Artemis was the main goddess of Ephesus and the Ephesians built the biggest ancient temple ever dedicated to her. MCPE: There are always people who have 'been-there-done-that'. I still think it would be such a shame for them to stay on the ship while in Kusadasi. Which tours would you recommend for them? GONCA: Most people know of Ephesus only as a point of interest around Kusadasi. But there is so much more than Ephesus and Virgin Mary's House to be seen in the area. There are also the ancient cities of Priene, Miletos and Didyma nearby. These can be visited in one of the day tours with Magical Steps. Also there is a lovely National Park in Kusadasi, nice Water Parks and authentic Turkish villages. We can arrange customized tours according to the visitors’ requirements. MCPE: During spring and summer holidays there are many kids and teenagers who accompany their parents on the Mediterranean cruises. What part of your daily Ephesus tours do you think they will love best? GONCA: We suggest a half day Ephesus Tour for families with children. We can also add horse riding, swimming or Waterpark activities in the itinerary. MCPE: Some of our readers might have walking disabilities. What tours would you suggest for them? GONCA: Private tours with Magical Steps are the best choice for them as our guides adjust the tour pace according to them and we can always provide a wheel chair for them. If there are places to climb or steps, we let the visitors know about them and organize the trip accordingly. MCPE: Which part of Ephesus is your personal favorite no matter how many times you've been there? GONCA: Of course the Ancient Ephesus is my number one. But I also love the House of Virgin Mary because of its natural beauty and peaceful atmosphere. I like the views from St. John Basilica. MCPE: And now, my favorite subject: shopping! Turkish rugs are one of the most authentic things one can take home from this part of the world and many people come to Turkey excited about getting a new rug. Can you arrange a free Turkish rug demonstration during the tour? GONCA: There are many Weaving schools in the region. The students are young village ladies from the Ephesus area. If required, our guide takes our visitors to those places. We always suggest to our visitors to visit a Carpet Weaving School or Carpet Weaving Villages rather than just Carpet Shops, because here they actually have a chance to see young ladies weaving carpets, learn about the process of making traditional handmade carpets including the fine silk ones. What is really interesting is seeing how the Turkish type of knot is done. MCPE: Even after seeing at least 50 Turkish rugs demonstration so far, personally, I can't get enough of them. But some people still don't wish to attend a carpet presentation during their tour. Can this option be arranged when booking a tour with your company? GONCA: Of course, if a visitor is not interested in the carpet making presentation and if they inform us at the time of booking, we will tell their guide not to take them there. Magical Steps lets their guest arrange the course of their private tours. MCPE: The ladies reading this know Turkey is a great place to buy leather and jewelry, too. Will there be any time for leather and jewelry shopping during the tour? GONCA: The guests can let us know about these kinds of requests at the time of booking. So we’ll be happy to arrange time for leather and jewelry shopping as well. What our guests always enjoy most is the leather fashion show at the Populer Leather Outlet as well as Jewelry and ceramics shows and we can always suggest the best ones to visit. MCPE: And at the very end, do you have any additional tips for our readers when booking a daily Ephesus tour with you? What other specifics should they make mention of when making arrangements? GONCA: The guests are welcome to let us know of any of their expectations and requests. We can arrange a very flexible itinerary. For example they may request a more religious tour, or the ones who have children may ask for a more fun tour. Some guests may want to learn more about archaeology while the others may want to take more pictures. Our tour guides will adjust the tour according to their wishes and expectations which is one of the biggest advantages of taking Magical Steps tours. And needless to say, we will always make sure you are back to your cruise ship on time! You can read about this and many other questions you may have regarding our tours on our Magical Steps FAQ page. We really do our best to make our visitors’ stay in Ephesus truly MAGICAL! MCPE: Gonca, thank you so much for your time and this valuable information! To inquire about the availability of private tours with Magical Steps on the date of your arrival, use the form below. Due to their 5-star status, they do sell out quickly so do it now to avoid any future disappointment.